* Up to 4 children (ages 5 and under) ride free with a fare-paying passenger. ** For income-qualified adult riders. Eligibility required. Must be stored on ORCA Card. See if you qualify. † For seniors (age 65+), individuals with disabilities or Medicare Card holders. Must show a Regional Reduced Fare Permit (RRFP). ‡ Paratransit service for persons whose disabilities prevent them from using regular bus service. Eligibility required. More about Access and how to apply. * Up to 4 children (ages 5 and under) ride free with a fare-paying passenger. More about traveling with children. Available only for approved Americans with Disabilities Act (ADA) participants with valid Access identification. and Regional Express buses, including those operating in neighboring counties. Stored value on an ORCA card used in place of cash. The value will automatically be used to supplement a pass if the fare for a trip is worth more than the pass value. When you pay with your E-purse, you will get a two-hour transfer credit*. The E-purse cannot be used on Access Transportation. *Two-hour transfers are not given or applicable on Washington State Ferries. Transfers are free on Metro buses, however if you are paying with cash and use more than one transit system you will have to pay a fare each time you board a different bus (including Metro-operated Sound Transit buses). Regional day passes are loaded on ORCA cards. Starts with first use and ends at 3 a.m. the next day. Accepted for regular service on public buses, trains, streetcars and water taxis throughout the Central Puget Sound region. Not valid on King County Metro Access, paratransit services, Kitsap Fast Ferries or Washington State Ferries. Not available for Autoload. If the cost of your trip is more than $3.50 adult or $1.75 RRFP, youth or ORCA LIFT, pay the difference with E-purse stored on the ORCA card. On a bus, additional fare can also be paid with cash. Can be purchased wherever ORCA cards are sold. ORCA card is not included in price. ORCA cards cost $5 for adult and youth cards. ORCA RRFP cards are initially issued free of charge to senior riders (age 65+) and riders with a disability. A regional transit pass valid for unlimited rides in the valid month. A combination monthly pass valid for Metro Vanpool riders that provides unlimited rides on Metro buses and $99 towards your Vanpool fare. Pay your vanpool fare with check, ORCA Card or employer-provided vouchers. 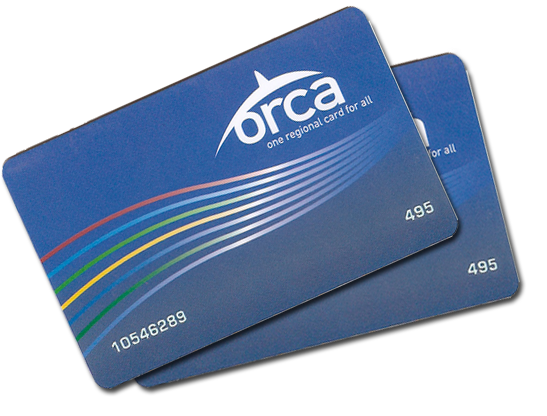 The ORCA card is all you need to pay your fare on public transportation in the Puget Sound region. An ORCA card works like cash or a pass, and also lets you transfer between the bus, Link light rail, Sounder, the Seattle streetcar and the King County Water Taxi. 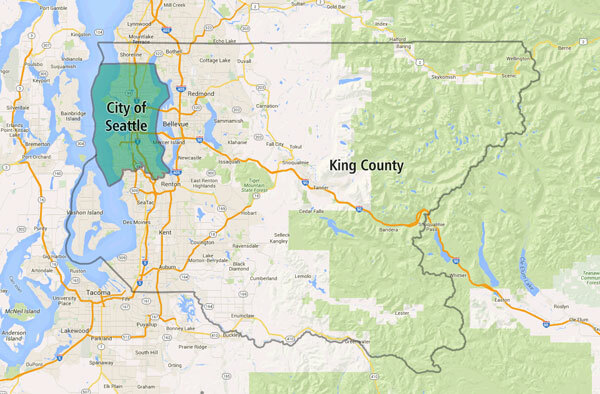 The city of Seattle is one zone and all areas outside the city, but within King County, are a second zone. 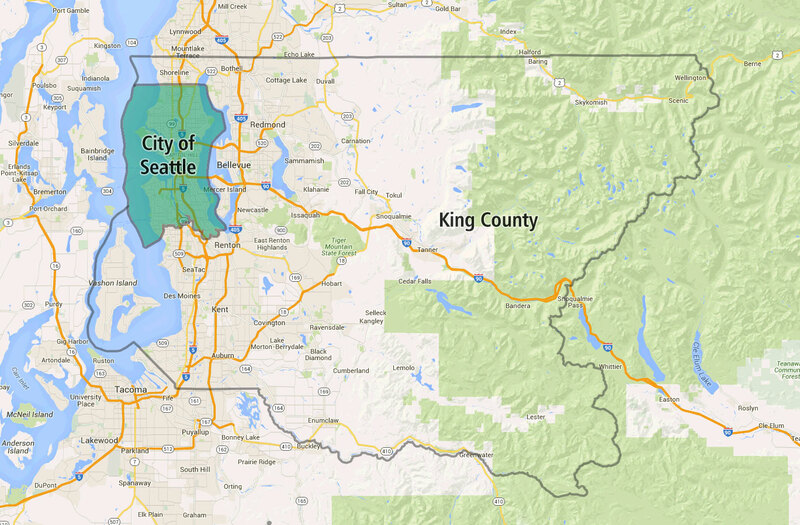 Any time you cross the Seattle city limits during peak time, you will be charged a two-zone fare. If your trip begins or ends on a zone line, you pay a one-zone fare. Peak fares are posted on the farebox on the bus, shown in the fare calculations in itineraries generated by the regional Trip Planner, and marked by shading on Metro's paper timetables. Peak fares are automatically calculated when an ORCA card is used. An additional fare is indicated if an off-peak pass is used for a peak trip. Peak fares are not charged on weekends or holidays. Bikes and buses are both part of the solution for reducing traffic congestion and improving our environment. Please take a few minutes to read some basic tips on how bikes and buses can coexist effectively. Drivers are required to permit any customer with a service animal to ride King County Metro buses. This includes animals-in-training accompanied by a trainer or person with a disability.